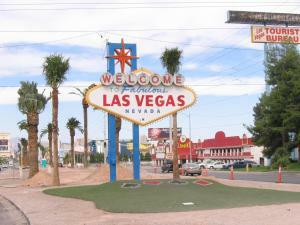 source Trabber offers in Las Vegas 221 hotels for the visitors of this city in United States. Has a population of 583,000 residents. The currency used is the US Dollar ($). The main touristic attractions are Fremont Street Experience, Golden Nugget Las Vegas, Stratosphere Las Vegas, SLS Las Vegas, Las Vegas Springs Preserve and Adventuredome. The closest airports to the city center are North Las Vegas (7 km), McCarran (10 km) and Henderson Executive (22 km). The more centrally situated hotels in Las Vegas are Downtown Grand, an Ascend Hotel, Oasis at Gold Spike, El Cortez Hotel & Casino, Main Street Station Casino Brewery and Hotel and Downtowner Motel. You can find cheap hotels in Las Vegas from $52 per night.